I cannot believe that the Holidays are already upon us! This is the time of year when I usually start thinking about making our Holiday card. I take pride in making our Holiday card, even though the paper card has become more obsolete with the use of electronic transmission and electronic devices. However, people, including myself, enjoy receiving actual cards in the mail, which brightens one’s day! It also provides an opportunity to use some of my photographs while highlighting the year. I think people are visual, and enjoy seeing photographs on Holiday cards, which also makes a nice keepsake. I try to complete and order our Holiday cards prior to Thanksgiving, which allows for additional time if needed. Usually, I put something together and revise and continue to revise until I get the card just right! Then, Doug reviews and gives his feedback. Then, I make the final changes based on his feedback and he proof reads one last time! I, of course, address all of the envelopes! Even though it takes me quite a bit of time culling through and selecting photographs and designing these Holiday cards, I enjoy making our Holiday card highlighting the year. Hopefully, people enjoy receiving them as much as I enjoy making them! Last year’s highlight and theme of our card was the introduction of Biscuit into our lives. I like to coordinate our Holiday card so everything flows together and is cohesive. I like cards that are simple, elegant, and tasteful and printed on good quality matte heavy card stock. Below is an outline of what I made last year, as I keep this in mind while I am working on this year’s Holiday card! Card: Last year, we sent out this flat card printed on matte heavy card stock from Minted shown below. (We also wrote a message and included a family photograph with Biscuit on the back of our Holiday card, which is not shown below). I was quite pleased with the way our Holiday card turned out, and the Minted customer service people were quite helpful with answering questions. I am already working on this year’s Holiday card and I will use Minted again. 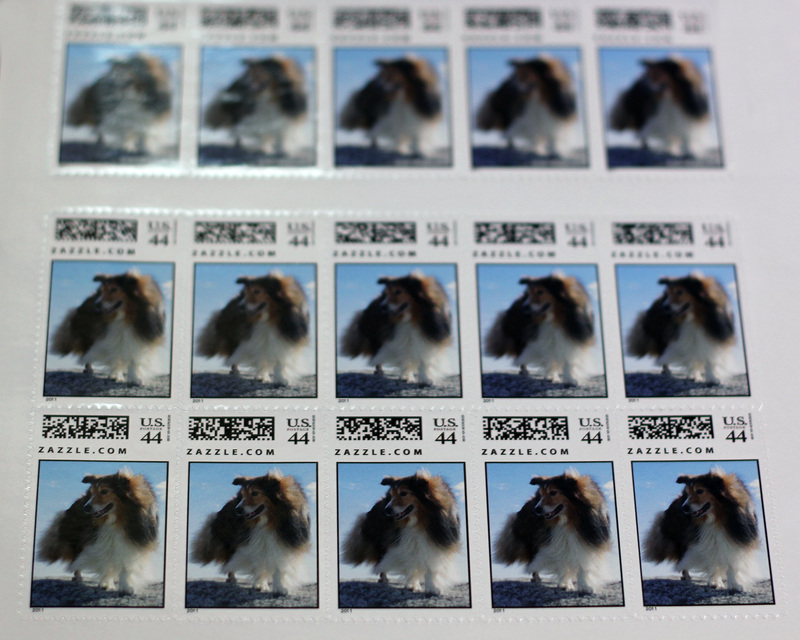 Stamp: Last year I made a custom stamp featuring the above photograph of little Biscuit! I plan on using a custom stamp for this year’s Holiday card as well! It really adds an unexpected fun and personal touch to the Holiday cards – at least I think so! 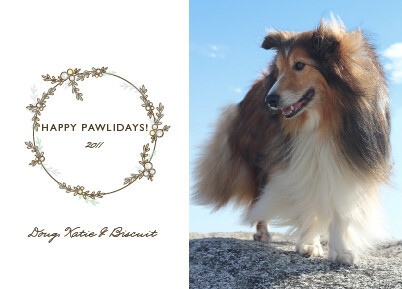 Seal: Last year I made a custom sticker to use as seals for the envelopes on our Holiday cards using the above photograph of Biscuit! I also plan on making a custom seal for this year’s Holiday card! The seals are helpful and it is a great alternative and time saver to using a wet sponge and/or licking the envelopes! The seal also adds a nice personal touch. Return Address Label: I use a simple return address label using black text on a clear/transparent label for my Holiday cards. I hope that this was helpful for those of you who savor photographs and cards. Have fun making your photo Holiday cards this year! ← A Sheltie Pumpkin and a Sheltanda!